Are you importing toys, electronics or consumer goods from Asia into the United States or Canada? If so, Shipwire can help you with import, receiving, packaging and order fulfillment. Imagine being able to focus on growing your business rather than packaging, shipping and fighting with your parcel carrier. Experienced professionals help you take time and costs out of your container shipping. Import and freight movement assistance. Multiple warehouses around the globe allow you to strategically locate inventory closer to your customers to help you manage shipping and product costs. Flexible receiving options for master cases, not palletized inventory and special warehouse receiving, kitting and assembly work orders. Web Store and ecommerce order fulfillment ready. eBay, Paypal, Yahoo, Google and online store compatible. Shipping rules, returns preferences and easy outbound shipping options give you power over your shipping costs. 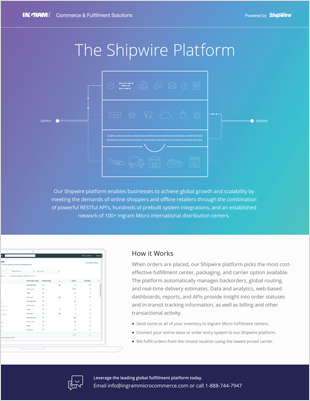 Shipwire offers a Free Trial. All of our plans are month-to-month. That means you don’t sign long-term contracts and Shipwire has to prove our value to your business every day.